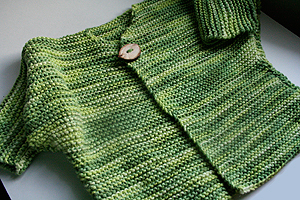 Great knit in one piece cardigan - start at the back bottom and knit right on thru to the front side, then stitch up the sides. EASY! *by downloading our free pattern you agree to be added to our knitlist. The VERY easy 1-button Cardigan in Blue Sky Alpacas Organic Cotton Multi Color #6802 GHERKIN, it uses 4 skeins with a bit left over for hat/booties.